For the Indian Country Today Media Network, Stephanie Woodard monitored enforcement of voting rights reforms for historically disenfranchised Alaska Natives. 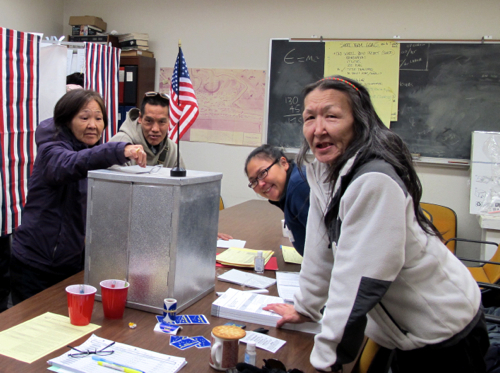 Alaska Natives had won a language assistance lawsuit and had organized early voting – better suited for subsistence hunters and fishermen who cannot plan trips to distant voting locations on Election Day. The result: turnout soared. But at the Pine Ridge Indian Reservation in South Dakota, she discovered evidence of voter suppression. The Justice Department intervened, and Native voter turnout surged. Read the five-part series from Alaska: (A Seat at the Table), (Celebrates), (Election Morning), (The Alaska Native Way), and (One Voter at a Time), her photo-essay on Huffington Post, and the two-part series from South Dakota, (The Sheriff), and (A Bumpy Road). From Peggy Orchowski for The Hispanic Outlook in Higher Education Magazine, the story of Hispanic students who want to pursue graduate degrees in engineering but are frustrated by the preference given to international students – in the form of research and teaching positions that underwrite the costs of their education. “Latino students have to learn how to find their own resources,” one college official told Orchowski. (Washington) The January 15, 2015 deadline for applications has been extended to Monday, February 2, 2015 at 5pm Eastern time. The Fund for Investigative Journalism is currently accepting applications for domestic and foreign investigations.